Last Sunday, after I posted my most recent blog, Climate Educators Wanted, I visited the Green page in HuffPost. My eyes lit up. Before my eyes, the GREENscape slowly turned into a story. Stories are nothing but fragments from life put together. Here’s how this story came together. About midway down the left column, my earlier post, Letter to Young Americans was still visible. Right above it was a Shell oil ad. The ad and the story each occupied an equal amount of space, so that was a good beginning. Here is a quick read: the ad says, “Let’s Go,” asking all of us to join in. The story asks all young people to join in. The ad says, “Go Further,” telling us to progress into the future. The story says, “Start the climate revolution now,” for the purpose of a brighter future. The ad and the story outwardly appear to be saying the same thing and peacefully cohabiting in the HuffPo GREENscape. It’s time that we also take the road less traveled––the one with a clean energy future. About the oil that we’ve got. Resource expert Michael Klare keeps pointing out that there is no easy oil anymore, only extreme energy in faraway places like the Arctic or in deep oceans. And it comes to us with great devastation. On May 27, President Obama suspended Shell’s Arctic drilling plan for 2010. So I thought that this particular story had ended for the year and we’ll reopen it again next year. But like all good stories, it became more like a large onion with many layers to peel. Back to the HuffPo GREENscape. 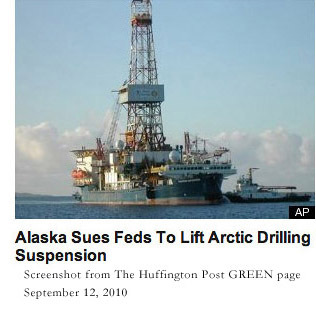 I saw that, two columns to the right and about an inch down, there was a news story with title, Alaska Sues Feds to Lift Arctic Drilling Suspension. Here is how that story came to life. Interior Secretary Ken Salazar visited Arctic Alaska at the beginning of this month. His itinerary included a town hall meeting in Barrow (the northernmost Inupiat community in Alaska), a stop at the National Petroleum Reserve–Alaska, and a flight over the Beaufort and Chukchi Seas. Then on September 4, there appeared a story in the Los Angeles Times with a headline that read, Salazar: Arctic oil drilling must wait. In that piece you’ll see my polar bear photo with the Beaufort Sea in the background, one of the two Arctic seas that Shell wants to drill for oil. But of course the story couldn’t end there, either. There is a lot of money at stake for Shell. They have already spent more than $2 billion in lease sale and probably several hundred million already in other operations and PR in the Arctic communities and outside. Did Shell arm–twist the Alaska state government? From my decade–long experience working on Arctic Alaska issues, all I can say is––most likely. So there you have it. The State of Alaska is so willing to allow Shell to go drill in the Beaufort and Chukchi Seas that it sues the Feds to lift the Arctic offshore drilling ban. Back to the ad: Shell wants to “Go Further.” As it happens, Shell has actually gone very far. Perhaps not as far as Star Trek’s famous where no man has gone before, but quite close––all the way to Sakhalin Island, on the Sea of Okhotsk in Far Eastern Siberia, to drill for oil. I’ve also been to Far Eastern Siberia, to the Yakutia province, the largest sub–national entity in the world. But I’ve never been to Sakhalin in person. However, I’ve been there through stories told by none other than the master storyteller Anton Chekov. In 1890, Chekov made a seven–months–long journey to the Tsarist penal colony on Sakhalin Island. Chekov's journey was so amazing that he regularly wrote home about it. His book, Sakhalin Island, is now considered a masterpiece of world literature. Shell’s journey to Sakhalin, on the other hand, is something no one would want to write home about. As a storyteller I believe in retelling stories again and again, because stories keep a culture alive. So here are some fragments from stories told by others about Shell’s journey to the Sakhalin. Claude Martin, The New York Times, December 2, 2005. Seth Borenstein, Associated Press, September 13, 2010. The news hit me like a rock. I have spent much time in Point Lay, an Inupiat community, and have walked some of the barrier islands where these walruses are probably jammed together right now. These animals are already seriously stressed by climate change, and now Shell wants to go drill for oil in the Chukchi Sea. None of this bodes well for Shell’s drilling plan in the Beaufort and Chukchi Seas of Arctic Alaska. It’s time Shell gave up on their hope to drill in America’s Arctic Ocean and started spending their money to build a clean energy economy and create real jobs right here in America. 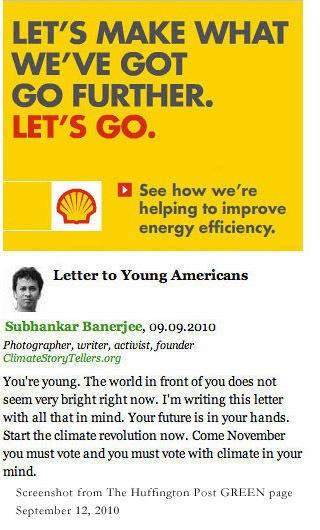 Then we’ll surely write home about “Shell’s Journey to the Clean Energy Future,” and we’ll take Shell’s “Let’s Go” to heart. This will surely “Go Further” into a cleaner future for all life. Who knows? Like Chekov’s book, such a story could eventually become a masterpiece as well. But until then, we must stop Shell’s plan to drill in the Beaufort and Chukchi Seas of America’s Arctic, no matter how many “Let’s Go” ads they place in the HuffPo GREENscape.